Fredrik Raddum’s (1973) new exhibition “Cover Up” opens Thursday January 8, at Galleri Brandstrup in Oslo. 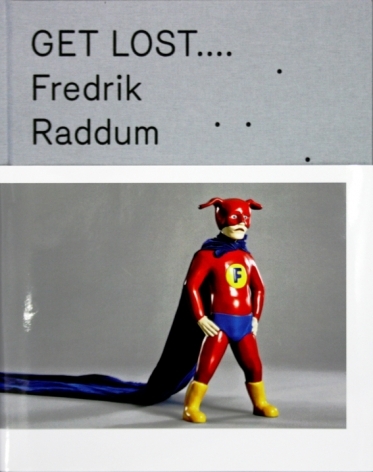 Raddum is educated at the National Academy of Art in Bergen and Oslo, Norway, and is known for his figurative sculpture and installation art. With conceptual sculptures, Raddum creates a world of figures in different situations that resembles a dystopian cartoon. In 2012, Raddum held his last exhibition at Galleri Brandstrup titled “Malaise”, which had its thematic foundation in the darkness of human nature. “Cover Up” further explores his self-created universe, but this time the main subject is directed towards visual elements of the hidden and unexpected. What is covered up and what is covering the different sculptures, varies from piece to piece. The basis of Raddum’s artistry revolves around his favorite subject: the late-modern man’s life and identity. This is also the underlying theme for this exhibition where Raddum gives away his power as an artist to the viewer, who is left with the control of creation. By hiding the sculptures underneath different objects, Raddum creates a visual effect that makes the audience curious, and he has their attention that invites audiences to enter Raddum's captivating and quirky universe. The dystopian theme comes forth on a thin line between tragedy and humor. In Raddum’s universe, what seems to be a harmless work can really addresses existentialist and political subjects. However, he always keeps a sense of humor and he has a keen eye for the absurd. Repetitively he shows us subtle and intelligent social satires, without an obvious display of critical attitude. In “Cover Up”, the reflection towards the hidden plays a central role, as the sculptures critical and essential meaning is only exposed by close consideration. In this manner Raddum does what he has never done before, he conveys the explicit and makes us wonder. In some cases, we get answers and in others, we may never find anything more than a cover. Raddum has always incorporated specific themes in his sculptures, some subtle and some more explicit than others. By fixing our eyes at what is covered, he also makes us reflect over what we actually see in the people that surround us. Do we ever get to know one another, in a shallow and consumerist world? This is one of the questions that may occupy the viewer, when seeing this new series of eye-catching artworks, which will encourages smiles and simultaneously is food for thought.